In the last issue of Open Door we featured an article about caring for a newborn baby when you have MS. 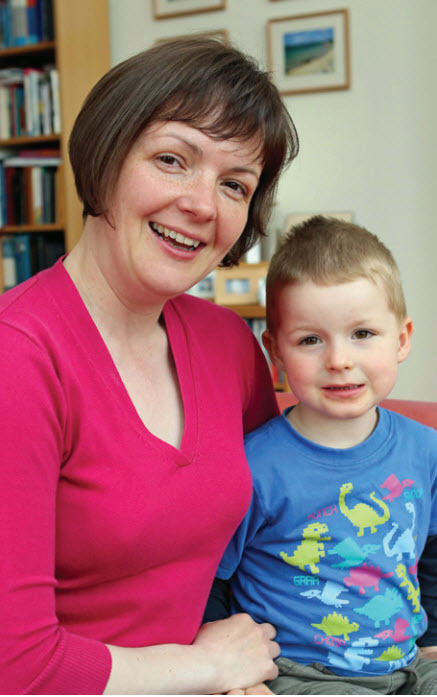 This issue we hear from the BBC journalist Elizabeth Quigley, about how she finds managing her MS while bringing up her four-year-old son, Matthew. “MY MUMMY’S GOT wheels!” Matthew says proudly to his friends and in a very matter of fact manner. Apart from making me sound like I’m a character from the 1970s animation Chorlton and the Wheelies, I’m proud too. Proud that he’s so accepting and proud that he’s not bothered that I have to use a stick or the aforementioned wheels – my walker with wheels. Matthew is four now and I definitely think he knows something is different about his mummy. None of his friends’ parents use a stick or wheels. But he doesn’t question it. He just accepts it. And so do all the children of the same age. They have no concept of whether they’re supposed to be embarrassed or think something’s odd, they’re just, like: “Wow, what’s Matthew’s mummy got? That’s great! She has wheels to push along”. The wheels and stick certainly help me to get around more easily but I haven’t yet found anything which makes it easy to keep up with a toddler with seemingly boundless energy! Matthew races around endlessly, climbs on everything and can easily outrun me to raid the fridge – and he does. That’s not easy for any parent of a toddler; for a parent with MS it’s challenging to say the least. I’ve learned new negotiating skills in my efforts to address this – although to be perfectly honest, Matthew is definitely better at this than me. At the end of some particularly intricate discussion over the idea that only one yoghurt is allowed after dinner, I feel very pleased with how it’s turned out. Until I realise that I have agreed to him taking three in return for him getting his own spoon out of the cutlery drawer and waiting for me to get into the kitchen before he eats them. I know which one of us would make the better UN negotiator – and he’s three feet tall. I’ve learned we sometimes need to do things differently. I can’t run around hitting tennis balls back and forward with Matthew – but I can sit down opposite him in the garden and play swing ball with him quite happily. Of course I wish I could play tennis or kick a football around with him – but, to be honest, even without MS, I was pretty atrocious at those games. In his early toddling days, though, he did give me a few potential scares – although he very quickly turned round and came back to find me when he spotted I wasn’t following immediately behind him. Matthew is very independent which definitely has advantages. And disadvantages. He’s not keen on holding my hand but he’s probably being wise beyond his years. I’m unsteady on my feet at the best of times, so I could easily be pulled over if he starts to go in a different direction. He might not hold my hand when we’re out – but he does hold firmly onto the side of my wheels when we’re near a road or we’re going somewhere unfamiliar. And in future years, how will I explain to Matthew that his mummy has this baffling condition called multiple sclerosis? I’ll tell him that my legs don’t work as well as they used to and that my hands can’t write or draw with pens and pencils as well as they used to, but that it doesn’t really matter. Everyone has challenges to overcome whether or not they have MS. What matters is not what we can’t do, but what we can. And that is what I keep reminding myself. Having MS certainly throws up challenges and obstacles. But through it all I try to remember these early years are a time of wonder, joy and frustration – for all of us. And when I find I’m exhausted, after a night of broken sleep, brain befuddled by endless questions and juggling, I remind myself that that’s not being a parent with MS. That’s being a parent. Being a parent can be tiring at the best of times. But combine that with MS and you have a recipe for fatigue. Joanne Hurford is an Occupational Therapist (OT) at the National Hospital for Neurology and Neurosurgery and often helps mums and dads with MS learn ways of conserving energy so they can cope with the demands of work and parenthood. Here she shares some of her top tips. OTs can’t magically give you more energy or time, but they can work with you to understand your choices and priorities and provide a structured and supportive approach to help you deal with everyday tasks. They can look at a particular task or the overall impact of having to juggle a busy life with MS. OTs focus on helping you adjust the way you do things, and can help you find equipment to make things easier. To find your nearest OT visit mstrust.org.uk/map or ask your GP. Meals: Plan a one-pot meal for the family that can be reheated and eaten by different people at different times. Or better still, cook up a big pot and freeze some for another day. Also, think about using a slow cooker. They can really save on preparation and cooking effort. Entertaining the kids: Identify your local playgroups, garden centres or soft play centres where the kids can let off steam and you can have a coffee. Having other kids over to play can also take the pressure off you as a parent. Household chores: Does it need to be done or can someone else do it for you? If not, try and get the kids involved and make it fun. Lots of little ones love a duster or broom in their hands. Shopping: Internet shopping is the way to go. You can also avoid the delivery charges with click and collect and pick up last minute things. Drop offs: Could you share school drop-offs with other parents? If walking and parking is an issue for you, you could try talking to the school to see if they have any parking spaces you could use.